all in one software package. Nobody builds houses the same way as they were built in the past. So why should your systems be outdated or not in line with current building codes and practices? Software systems are now basic requirements for 21st-century construction. At present software is having ‘the greatest impact’ on the building industry. The Constructor package allows YOU, the Australian Builder this opportunity to future proof your Construction business end-to-end. If you are using Excel Spreadsheets, a pen or paper or have multiple systems in place then the solution is here. Choosing the right software should be easy, so before investing into any software, why not download our free PDF guide. Construction estimating and business management software for builders with all the time-saving tools you need to grow your business. Have a look at our features and give us a call for more information or book a demo today. With over 2,500 formulas built into the estimating software, we aim to make your quoting easy. Scan or import your plan for graphical takeoff, choose between fully automated or manual. 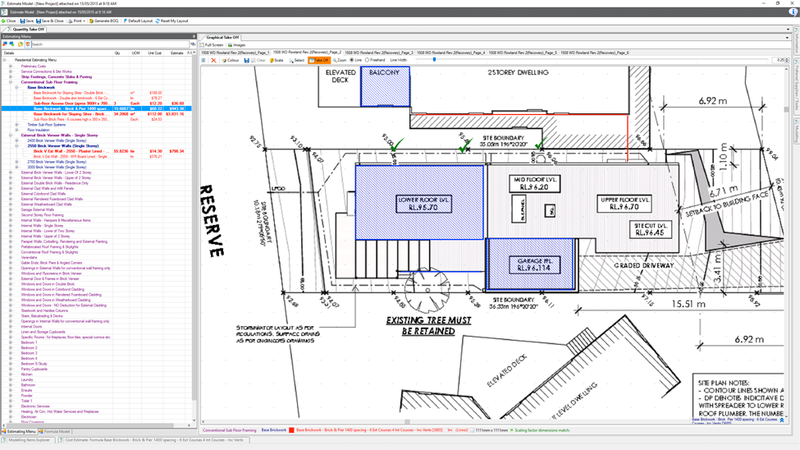 Build straight from the quote, produce purchase orders, bill of quantities and provide specifications with photos. Our fully integrated accounting software has been specifically designed for the building industry. Designed in consultation with Accountants who work in the building industry. It works seamlessly with every other component of Constructor to make your job and life easier. Use project scheduling to allow your projects to run more efficiently with fewer issues and mistakes. 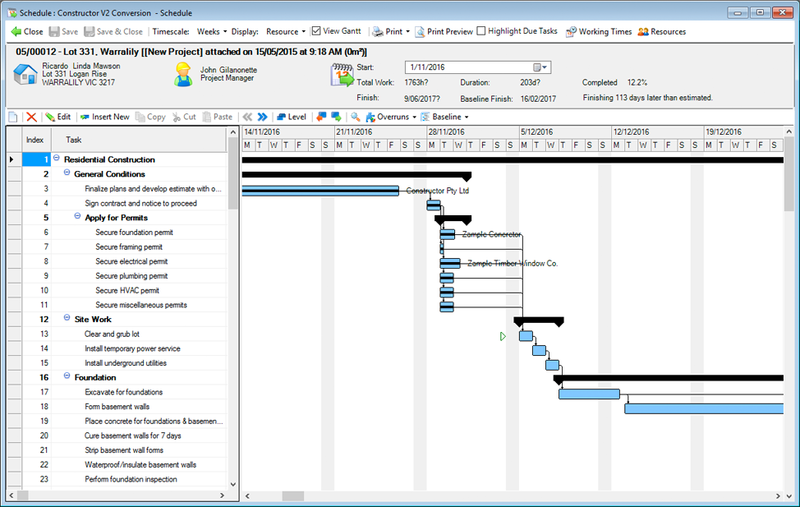 Our project scheduling adjusts durations from your estimate/ bill of quantities. The scheduling is fully customisable, track tasks, resources and will identify potential resource conflicts. Constructor allows you to keep track of your projects budgeted costs automatically created from your BOQ. Record actual costs and compare to your budgeted costs in real time. This gives you total control on whether the project is under or over budget and which cost centre or component is responsible for the variance. Allocate wages to jobs at direct cost or predefined rates, check the amounts in budgets. Keep track of entitlements, annual leave, personal leave etc. Schedule payslips automatically weekly, fortnightly or monthly. Produce payment summaries, submit data to the ATO, payroll activity reports & more! 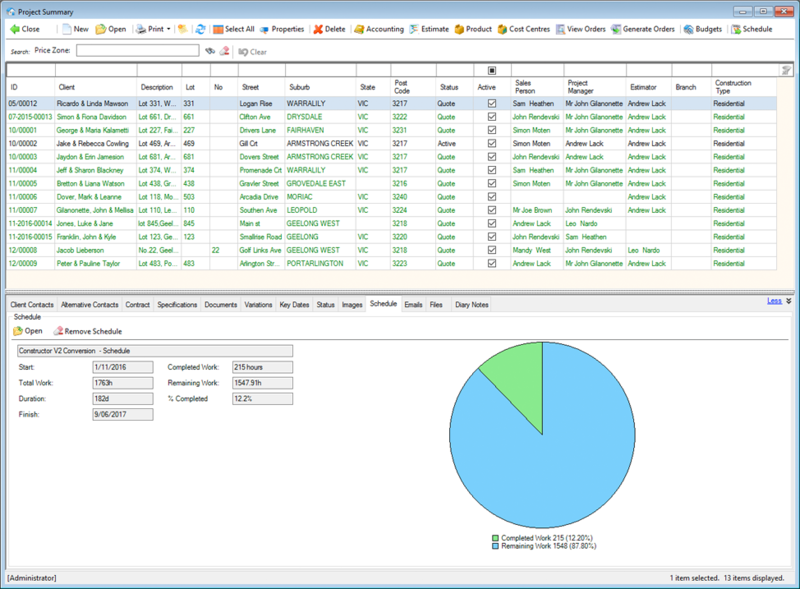 Our sales management module tracks potential, active, and past client interactions. Assign tasks, notifications and reminders so you never forget an appointment or request. Guide the client’s decision process through to a completed build and beyond. Create documents, task journals, appointments and other general correspondence in the integrated word processor and Constructor automatically files them against the project, client or creditor. Scan images such as plans and photographs to your designs. These can be instantly presented on screen to your client during the sales consultation.